The Apple Watch charger situation is a pretty solid bit of irony, wouldn’t you say? People have been complaining for years that the charging cord that comes with Apple’s iPhones is way too short, and now people are complaining that the Apple Watch cable is far too long. If you’ve been carrying it with you all this time, you should know that there’s a better way. Check out the Oittm Pocket Sized Travel Friendly Wireless Charger for Apple Watch. 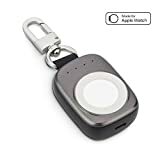 It fits on a key chain and includes an MFi certified magnetic Apple Watch charging disc. It also has a 700 mAh battery built right in, so you can charge on the go if you need to. Come with a Micro USB Cable to charge the Power Bank. Built-in Li-ion specific charging management IC, multiple safeguards protection against overcurrent, overheat, short curcuit and high temperature, better protects your iWacth while charging. Using MCU management to achieve the functions of iWatch wireless charging, overcurrent protection, eletronic quantities detection and display, provides a reliable guarantee for your iWatch. Features portable and wireless charging for Apple Watch, letting you get rid of the annoying long iWatch charging cable. Stylish and unique keychain design, lightweight and portable, fits perfect for home and on the go. Features 700mAh polymer battery, rechargeable and safe, charging your Apple Watch up to 3 hours.